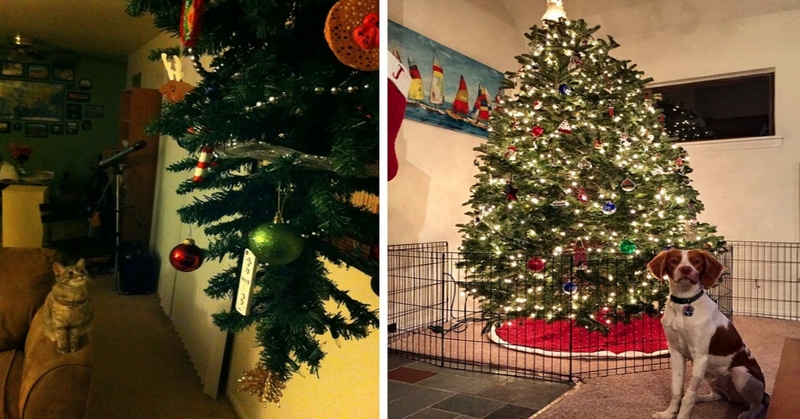 18 Genius Human Hacks To Protect Your Christmas Tree From Your Devil Pets! 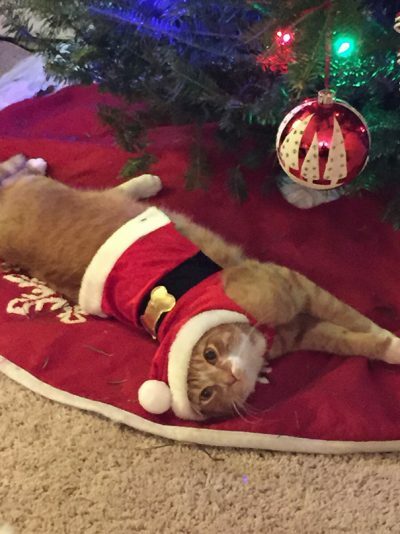 Well, it’s December…so, you know what that means! Christmas is in its 4th month, everyone is just pretending to work, it’s chocolate for breakfast every morning and our visits to the fridge almost triple! 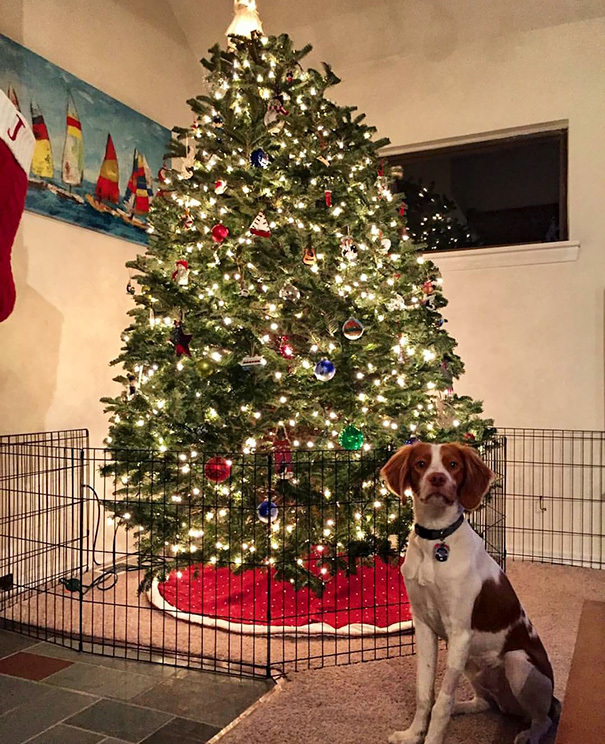 December can be a difficult month for some and it isn’t a happy time for everyone, but as always, PETS TO THE RESCUE! 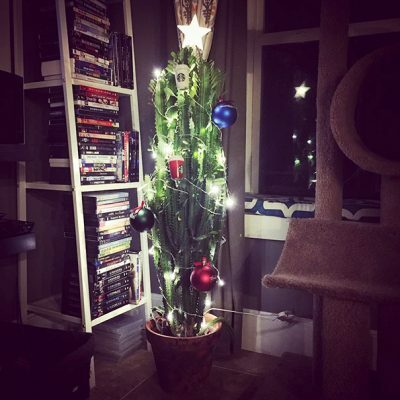 Anyone who is a pet parent will know the struggle of attempting to bring a TREE into the house where our furbabies dwell, their innate, wild instinct to DESTROY EVERYTHING suddenly becomes apparent! 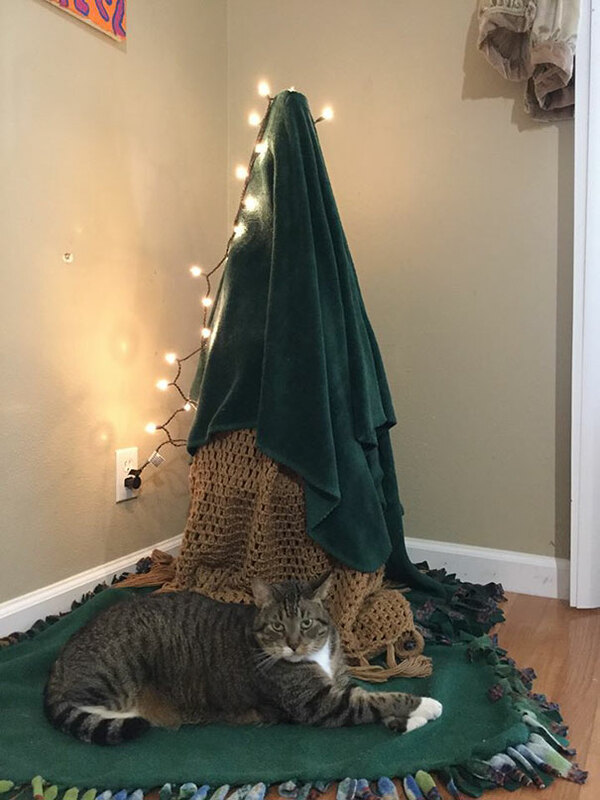 However, luckily, it seems that our hooman brains are becoming more and more adept at protecting our Christmas Trees from furbaby ruin. As these 18 hilarious pics prove…our Christmas tree protection game IS GETTING EPIC !! This looks like some kind of teleportation device!? 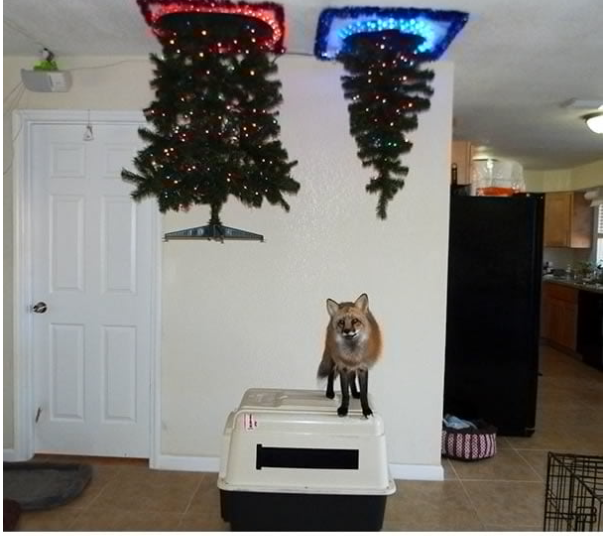 I can’t imagine the work that went into this, just to stop Mr Fox from having his evil way with the tree! Looks awesome though! Look at his little face, he’s so confused! It takes a lot to out sly a fox, but it looks like his hoomans have cracked it! 2. So close and yet so far! 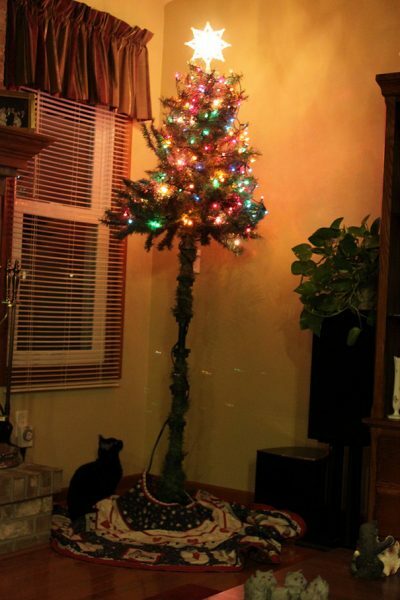 Christmas has gone all topsy-turvy for this poor guy, aw, poor kitty! Almost in reach, but not quite enough to do any damage…or make some kind of cat nest among the branches! 3. 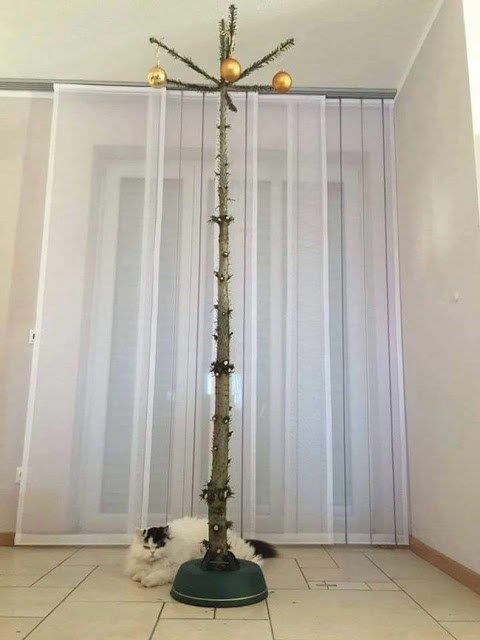 The perfect tree for cat owners! Like a tree…but it’s not! Well, it looks like minimalist is best when you’re a cat owner at Christmas! Poor kitty looks so angry! He’s totally done with lyfe. 4. 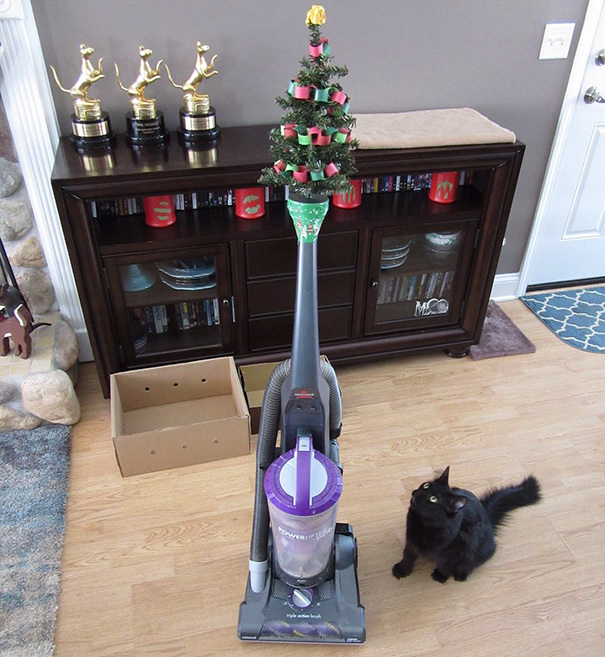 Cat owners always have to think on their feet! This is actually quite pretty and clever…it looks awesome! 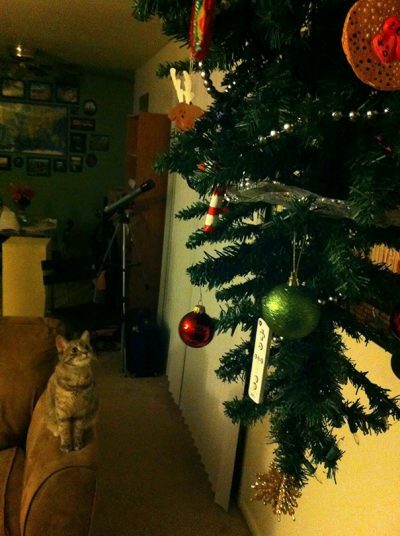 Plus, it’s enough to entertain kitty, but it’s unlikely to cause any damage. Although, from the looks of it, it looks like Mr Cat Face Esq. still wants to have a good go at it! 5. No, the other way around! Use a cage, by all means…but…for the tree instead! Why didn’t I think of that!? It’ll be so much easier! Now, anyone who has attempted to put any kind of outfit on a cat will know that this is the best punishment that anyone could think of! 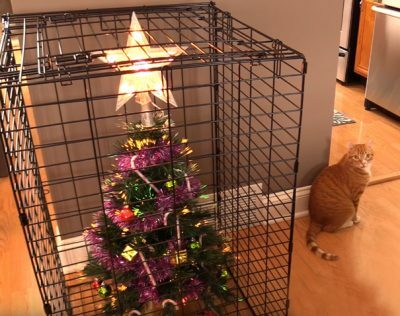 Although it’s a genius idea, I doubt Mr Cat will get too deterred by it! If anything, he’ll probably become more determined! 7. Works for Dogs too! Awww, he looks so sad! 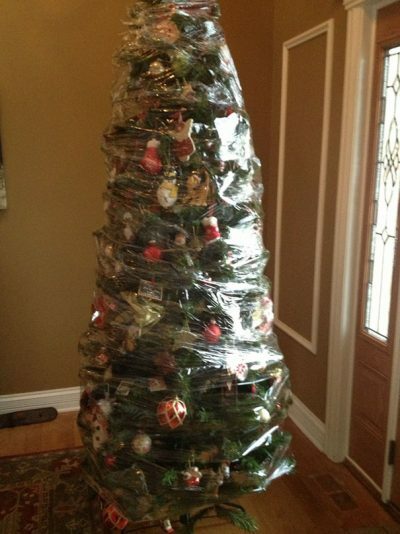 But that tree looks so pretty, so I’m not surprised that they’re going to extreme lengths to protect it! 8. Is that a Cactus or something!? Looks like these two fluffy, feline guards won’t let anything come between them and their Christmas Tree overload! I think we can all sleep soundly this evening, knowing that Christmas is protected by these two fuuurrocious protectors! 11. A tad extreme, maybe? 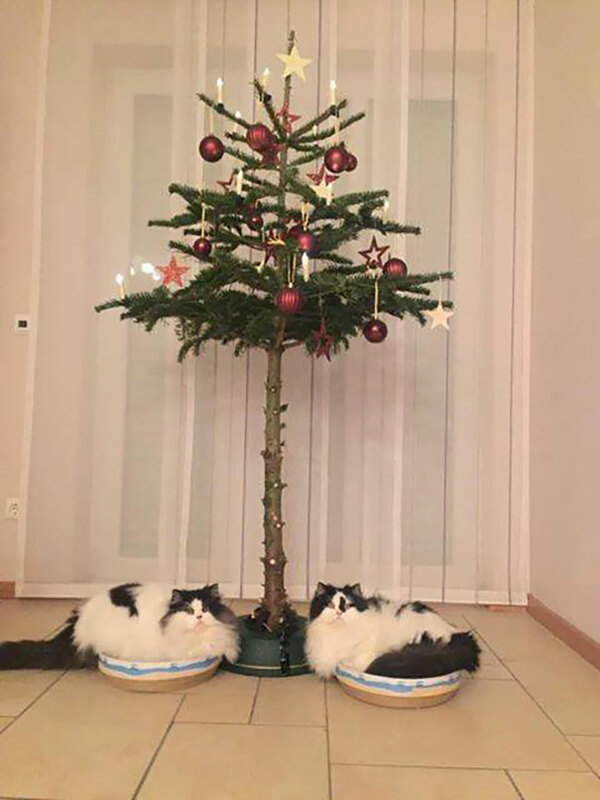 Great idea, but I feel like the people who put this tree up have TOTALLY had it, with it being destroyed by their furry minions. You’d have to be totally hacked off to go to these lengths! Oh well, that’s one way of keeping it readily decorated for next year, I suppose. 12. 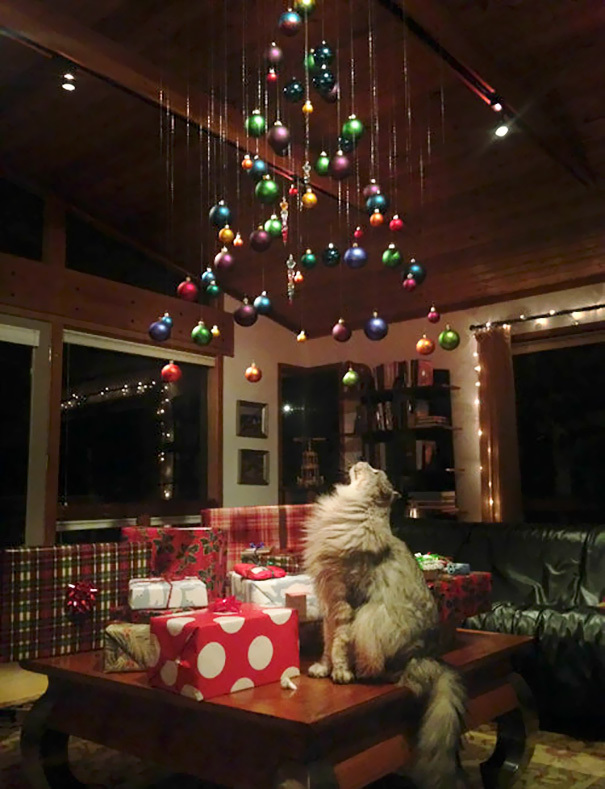 The perfect Christmas Tree for the world’s highest jumping kitten! What’s the betting that he’ll still manage to reach it, though!? I bet he’s stretching his kitty glutes as we speak in preparation for it! 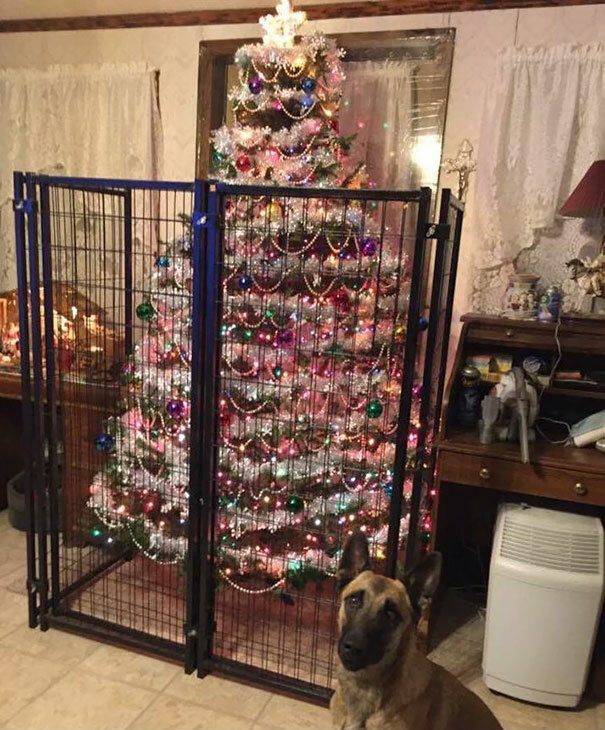 It seems like cages are the way to go in tree protection methods! Who’d have thought they’d have been more effective for the actual trees, rather than the animals!? 14. No, it’s not half done…it’s DONE! & So are the owners, by the looks of this! 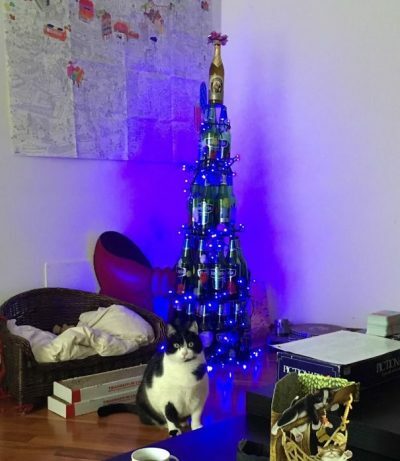 Totally done with their furbabies cr*p! Apparently, this is a “cat proof and environmentally conscious Christmas Tree”, made by turning a tomato cage upside down, adding a blanket and laughing hysterically because you know this is the only way to stop the lovely, little bast*rd from ruining Christmas…again! 16. Anti Gravity to the rescue! 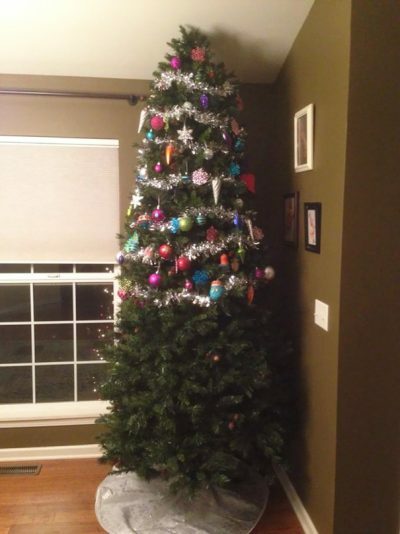 No, “Aunty Gravity” isn’t the long lost aunt who turns up drunk to the Christmas party and falls into the fireplace..it’s a totally awesome way of protecting your tree from eager claws and teeth! 17. Even the hooman babies are at it too! 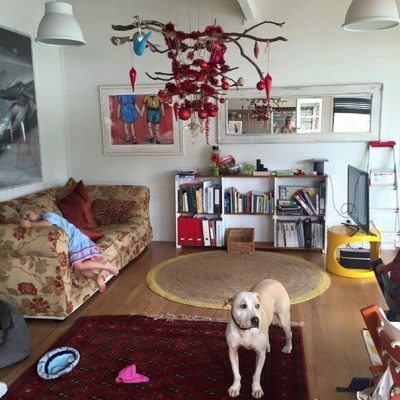 This pretty, little hanging tree wasn’t only fashioned with the resident Doggo in mind, but the resident baby too! Let’s hope that they don’t both gang up and find a way to destroy that thing! Everyone loves alcohol….don’t they!? Especially at Christmas! & The bottles are a great idea, they’re robust, cheap and pretty indestructible from furry hands. & Why not? At least it’s different!